Deb's Cup of Tea: Remember When? I have addressed the Christmas cards for all the cards I currently have. I need to go to the store and get another box. I thought I had it counted out correctly but I'm short. My October dream of making my own cards didn't get done. I'll get to it but I'm using up some old cards I've had for a few years. Also being used up in this are old stamps. We used to save some, when Carole was little, because my ex had a friend who collected stamps. He had a rather large collection, all identified and mounted. A stamp collection, as collections goes, doesn't take up that much room. My grandfather collected stamps and coins. I remember going to visit him and he'd have his collections out because he'd just found a stamp or a coin he'd been searching for. We were allowed to look but not touch. Now that Carole's on her own, I asked about the stamp collection. She's not interested in it so I've been using the stamps to mail what correspondence I do as well as the bills I don't pay online. Most of our collection is from when stamps were between 30 and 36 cents. That means I have to get a sheet or two of 1, 2 and 10 cent stamps. The stamps on the left required licking. You remember that, right? Stick out your tongue and apply moisture using that appendage. You mouth would dry out in December between licking stamps and licking the back of the card envelope. 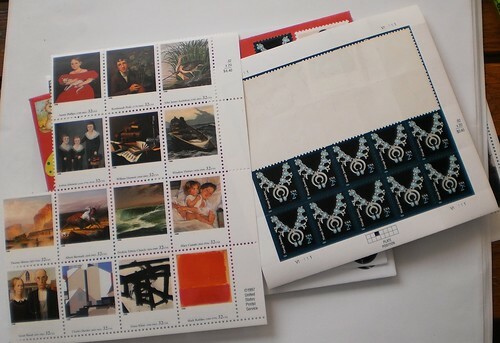 I realized that all stamps today are peel and stick. You can't find current denominations of the lick and stick variety. I'm not going to decry this. It's an advancement that is most welcome. I remember when the first peel and stick stamps were introduced and how some people said that was a travesty. Now, I don't think we'd have it any other way.